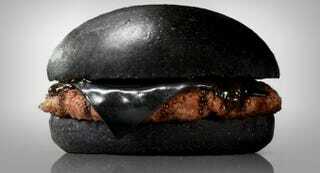 To no one's surprise, Burger King's all black burger looks like a disgusting turd in real life. Actually, it might be even worse than some turds. It looks like it tastes like ash. It looks like it's made from burnt cardboard. It looks like it'll bring death to anyone who dare eats it. There must be a better angle, right? Nope. Nope. Nope. Can adding lettuce and tomatoes help it look better? No chance. Who am I kidding. I'd still eat it.